Before joining Eagle Rock School (CO), students are tested. Though probably not in the way you think. As the recent documentary All Who Dare showcases, each cohort of new students leaves behind their families, friends, and familiar environments for a 24-day orientation program in the remote wilderness. Eagle Rock, a tuition-free, residential high school, is committed to helping the most disengaged students find their way back to an appreciation of education. For many students, it’s a last chance to find educational success. The school is an initiative of the American Honda Education Corporation, a nonprofit subsidiary of the American Honda Motor Co., Inc.
Honda and Eagle Rock were looking for unique opportunities to showcase the school’s 24-day wilderness experience and landed on the idea of a documentary film. 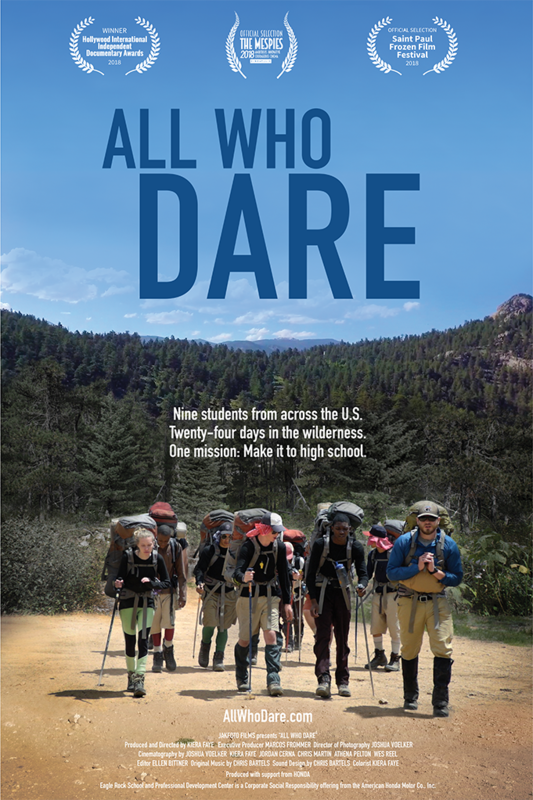 All Who Dare—also the school’s motto—follows nine incoming Eagle Rock students who embarked on the orientation trip in Colorado’s Lost Creek Wilderness in May 2016. Guided by experienced wilderness educators, the students are challenged physically, emotionally, spiritually, and socially. They quickly learn that completing the trip is only the first step in taking responsibility for their lives.